"Contacted, one feels, intends, and perceives. So these things are tottering and toppling; they’re impermanent, perishing, and changing. This is how consciousness exists dependent on a duality." Does the sequence after contact is feeling intention perceiving ? Or feeling perceiving intention ? "Contacted, one feels, intends, and perceives. Perhaps the listing is not intended to be sequential -- just that these all arise based on contact. (FWIW, in my experience, vedana often is clearest after perception -- oh, the sound is from jet engines: unpleasant. However, it could be said that the vedana based on perception is really the result of the contact between the mind and the perception. Last edited by JohnK on Wed Apr 25, 2018 5:23 pm, edited 1 time in total. 16. “Dependent on the eye and forms, eye-consciousness arises. The meeting of the three is contact. With contact as condition there is feeling. What one feels, that one perceives. What one perceives, that one thinks about. What one thinks about, that one mentally proliferates. With what one has mentally proliferated as the source, perceptions and notions [born of] mental proliferation beset a man with respect to past, future, and present forms cognizable through the eye. “Dependent on the ear and sounds…Dependent on the nose and odours…Dependent on the tongue and flavours…Dependent on the body and tangibles…Dependent on the mind and mind-objects, mind-consciousness arises. The meeting of the three is contact. With contact as condition there is feeling. What one feels, that one perceives. What one perceives, that one thinks about. What one thinks about, that one mentally proliferates. With what one has mentally proliferated as the source, perceptions and notions [born of] mental proliferation beset a man with respect to past, future, and present mind-objects cognizable through the mind. 17. “When there is the eye, a form, and eye-consciousness, it is possible to point out the manifestation of contact. When there is the manifestation of contact, it is possible to point out the manifestation of feeling. When there is the manifestation of feeling, it is possible to point out the manifestation of perception. When there is the manifestation of perception, it is possible to point out the manifestation of thinking. When there is the manifestation of thinking, it is possible to point out the manifestation of besetment by perceptions and notions [born of] mental proliferation. “When there is the ear, a sound, and ear-consciousness…When there is the nose, an odour, and nose-consciousness…When there is the tongue, a flavour, and tongue-consciousness…When there is the body, a tangible, and body-consciousness…When there is the mind, a mind-object, and mind-consciousness…it is possible to point out the manifestation of besetment by perceptions and notions [born of] mental proliferation. 18. “When there is no eye, no form, and no eye-consciousness, it is impossible to point out the manifestation of contact. When there is no manifestation of contact, it is impossible to point out the manifestation of feeling. When there is no manifestation of feeling, it is impossible to point out the manifestation of perception. When there is no manifestation of perception, it is impossible to point out the manifestation of thinking. When there is no manifestation of thinking, it is impossible to point out the manifestation of besetment by perceptions and notions [born of] mental proliferation. “When there is no ear, no sound, and no ear-consciousness…When there is no nose, no odour, and no nose-consciousness…When there is no tongue, no flavour, and no tongue-consciousness…When there is no body, no tangible, and no body-consciousness…When there is no mind, no mind-object, and no mind-consciousness…it is impossible to point out the manifestation of besetment by perceptions and notions [born of] mental proliferation. Cool, you've basically rediscovered the 5 Khandas, or 5 aggregates: form > feelings > perceptions > mental formations, > consciousness. For example, each time you see something, you go through this process in a flash. When there is Contact they can be delineated. As he was sitting there, he said to Ven. Sariputta, "Friend, 'One of poor discernment, one of poor discernment': Thus is it said. To what extent is one said to be 'one of poor discernment'?" "'One doesn't discern, one doesn't discern': Thus, friend, one is said to be 'one of poor discernment.' And what doesn't one discern? One doesn't discern, 'This is stress.' One doesn't discern, 'This is the origination of stress.' One doesn't discern, 'This is the cessation of stress.' One doesn't discern, 'This is the practice leading to the cessation of stress.' 'One doesn't discern, one doesn't discern': Thus one is said to be 'one of poor discernment.'" Saying, "Very good, friend," Ven. Maha Kotthita — delighting in & approving of Ven. Sariputta's statement — asked him a further question: "Discerning, discerning': Thus is it said. To what extent, friend, is one said to be 'discerning'?" "'One discerns, one discerns': Thus, friend, one is said to be 'discerning.' And what does one discern? One discerns, 'This is stress.' One discerns, 'This is the origination of stress.' One discerns, 'This is the cessation of stress.' One discerns, 'This is the practice leading to the cessation of stress.' 'One discerns, one discerns': Thus one is said to be 'discerning.'" "'Consciousness, consciousness': Thus is it said. To what extent, friend, is it said to be 'consciousness'?" "'It cognizes, it cognizes': Thus, friend, it is said to be 'consciousness.' And what does it cognize? It cognizes 'pleasant.' It cognizes 'painful.' It cognizes 'neither painful nor pleasant.' 'It cognizes, it cognizes': Thus it is said to be 'consciousness.'" "Discernment & consciousness, friend: Are these qualities conjoined or disjoined? Is it possible, having separated them one from the other, to delineate the difference between them?" "Discernment & consciousness are conjoined, friend, not disjoined. It's not possible, having separated them one from the other, to delineate the difference between them. For what one discerns, that one cognizes. What one cognizes, that one discerns. Therefore these qualities are conjoined, not disjoined, and it is not possible, having separated them one from another, to delineate the difference between them." "Discernment & consciousness, friend: What is the difference between these qualities that are conjoined, not disjoined?" "Discernment & consciousness, friend: Of these qualities that are conjoined, not disjoined, discernment is to be developed, consciousness is to be fully comprehended." "'Feeling, feeling': Thus is it said. To what extent, friend, is it said to be 'feeling'?" "'It feels, it feels': Thus, friend, it is said to be 'feeling.' And what does it feel? It feels pleasure. It feels pain. It feels neither pleasure nor pain. 'It feels, it feels': Thus it is said to be 'feeling.'" "'Perception, perception': Thus is it said. To what extent, friend, is it said to be 'perception'?" "'It perceives, it perceives': Thus, friend, it is said to be 'perception.' And what does it perceive? It perceives blue. It perceives yellow. It perceives red. It perceives white. 'It perceives, it perceives': Thus it is said to be 'perception.'" OP does not accept this tho afaik. the ability to see, hear, or become aware of something through the senses . the organization, identification, and interpretation of sensory information . What I think is today science and technology are far more advanced as compared to thousand years ago and that the way informations and knowledges today helps us understand better the processes of this human body than before . this is explicitly refuted by the Sutta i posted itt. I very much agree! -- I know/experience grasping and aversion, but have neglected really knowing the vedana step in DO. Thankyou for that sutta quote, Rightviewftw. Nevertheless, althought they cannot be separated and delineated, the 5 khandas exist as a process, a spectrum. You can point to a section of the process and say "here is perception." 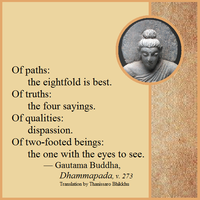 The Buddha is saying it is an interlocking process, not a series of independent and discrete events. althought they cannot be separated and delineated, the 5 khandas exist as a process, a spectrum. You can point to a section of the process and say "here is perception." 1. It is actually Sariputta talking not The Buddha if you are referring to the Maha Vedalla Sutta. 2. You are contradicting yourself when you say that X and Y cannot be separated or delineated from eachother and then go on to say that you can point out X from Y as that would be delineation and separation. So you are effectively ignoring the meaning of the words. Therefore these qualities are conjoined, not disjoined, and it is not possible, having separated them one from another, to delineate the difference among them." No, you just don't understand. To be honest, I can't be bothered to explain it. The view you expressed is not that hard to understand... However a contradiction there is explicit and if you stand by your statement as it is, then you are standing by a heretic statement. Explicitly contradicted by the Sutta. No, you don't understand the sutta properly. Call me a heretic if you want, but you are mistaken. Don't worry about it, it's a tiny thing. No, you don't understand the sutta properly. How would you know if i understand the Sutta properly or not, i have hardly commented on it. I just compared your statement to the sutta and pointed out what seems to be an explicit contradiction.